Singer and Somali politician Saado Ali Warsame, slain by al-Shabaab gunmen last week, debuted a protest song in 2011 entitled, “Dhiigshiil ha dhigan” (“Don’t Deposit with Dahabshiil” or “Don’t send your money through Dahabshiil“). The song was a rebuke of the remittance company Dahabshiil, and asserted that the money Dahabshiil makes off of Somalis “is destroying our land” and “will kill our children.” Unlike Warsame’s typically upbeat, jaunty numbers, “Diighshiil ha dhigan” opens with a world-weary, almost mournful tone that gives way to a Reggae sound throughout the rest of the song. 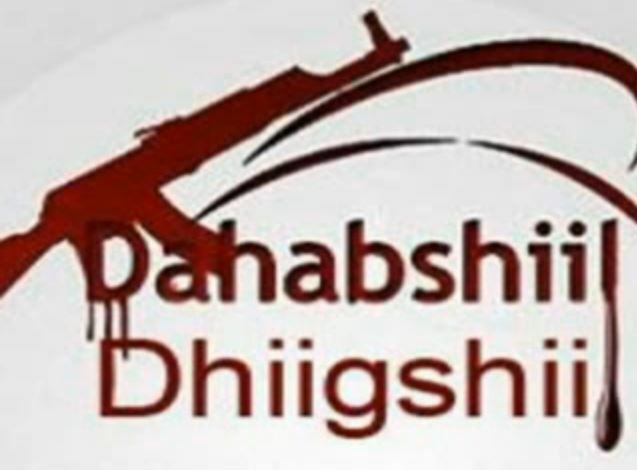 The 13-minute music video itself, apparently produced by Xildhiban Publications, shows scenes of armed Somali men and the victims of their violence spliced with scenes of Warsame performing and a graphic of a Kalashnikov firing across two blood-soaked words, “Dahabshiil” and “Dhiigshiil.” In Somali, “shiil” means “to smelt,” fry, or melt; “dahab” means “gold;” and “dhiig” means blood. The play on words suggests that rather than being a “gold-smelting” financial company, Dahabshiil is a actually blood-smelter. Somalis, do not deposit your money to his banks. Clearly, the lyrics pull no punches. After the song first came out, the website Microkhan reviewed it here, editorializing that “If I was an executive at Dahabshiil, I would be very nervous right about now.” Additional descriptions of the song appear here and here. Here is a written version of the (Latin alphabet) Somali lyrics according to Youtube video descriptions. Money Jihad is copying them here for the record because statements that put Dahabshiil in a negative light have a tendency to vanish or be suppressed in Internet searches. True, it’s worth examining all the statements of Taliban members, but their poems should not be embraced for showing the supposed humanity of the Taliban. The Taliban are not people just like we are—they are people very far different from what we are. The editors and publishers should do nothing less than donate 100 percent of the profits to British war veterans. Remember this Sesame Street classic? I’ll defend you at any cost. To make it all tax-free. Families of the 9/11 dead. So we can all bow to the East.